» Why Did LeBron and the Cavs Get Benched by the Knicks? 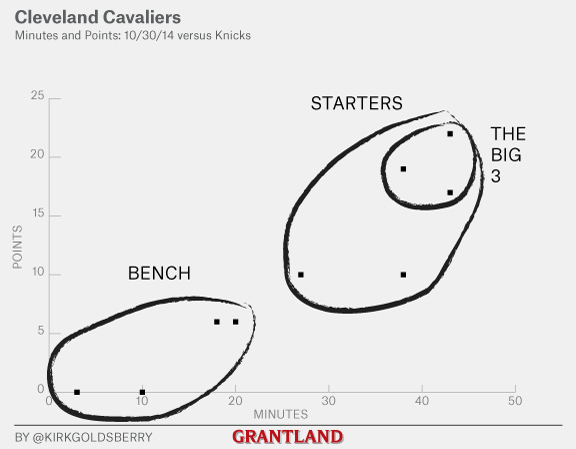 Why Did LeBron and the Cavs Get Benched by the Knicks? According to the script, the Knicks were supposed to show up, imitate the Washington Generals, and let Cleveland have its party in the first game of LeBron James’s second reign. But Carmelo got hot, the Cavs went cold, and next thing you know the Cuyahoga Globetrotters are weeping, while the Generals are up at Dairy Queen eating Blizzards™. Let’s not overreact, but the Cavs should be concerned with a few things. Their newfangled Princeton-style offense looked stagnant at times, their defense was less than dominant (DRtg: 111 per 100), and their bench looked shallow and inept. The offense will undoubtedly coalesce with time, and it’s foolish to judge a defense after one game, but that depth issue looks like a problem. 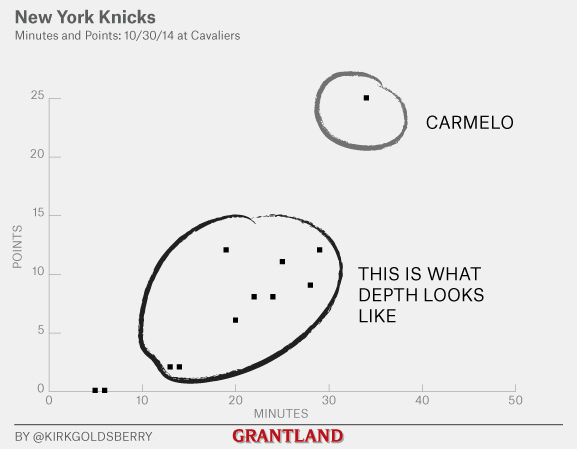 Cleveland’s bench was outscored by the supposedly laughable Knicks subs, 41-12. In a league that is beginning to value depth more and more,1 it’s unclear where the Cavaliers will find theirs. Their second unit combined to play only 51 minutes and failed to provide any spark. Mike Miller played three minutes, Tristan Thompson made a poor case for his contract extension, scoring six in 20 minutes, and Shawn Marion looked like he had enjoyed Copacabana Beach a little too much. LeBron and Kyrie Irving each played 43 minutes, Kevin Love played 38, and none of the Big 3 was able to find the extra gear late. Meanwhile, the Knicks bench logged 120 minutes (exactly half of the available minutes, btw) and J.R. Smith (25 minutes), Iman Shumpert (29 minutes), and Carmelo Anthony (34 minutes) each made big jump shots down the stretch, despite playing the second night of a back-to-back. The regular season is disproportionately cruel to thin, “new look” teams trying to find a groove. There’s not much time to regroup, rest, or practice. On Friday, the Cavs are in Chicago to face their brand-new rivals. There’s a very good chance they’ll be 0-2 by this time tomorrow. About those Knicks: Again, let’s not overreact, but that was a huge early-season win for Derek Fisher. The triangle era began with a loud, isosceles thud on Wednesday in their blowout loss to Chicago at home. So it was impressive to see the Knicks play so well the next night. As a whole, the team — in terms of both its bench rotations and its tactics — looked far more egalitarian than it did last season. Sure, there were times when “the triangle” seemed slanted toward Melo, but just like Cleveland, this team is entitled to some growing pains. Fisher’s use of his whole bench (only Cleanthony Early didn’t play) was really encouraging. Last year’s Spurs taught us many things, and their deep rotations kept everyone involved and rationed the energy of their star players. That was arguably the big difference in the postseason as they torched their way through the Blazers and Thunder in the Western Conference playoffs. Fisher spent his last game as a player futilely chasing around those energetic Spurs, and it appears he took notes. Perhaps David Blatt should take some, too; LeBron’s new figure is not the only thing that looks suspiciously thin in Cleveland these days.